Diana Montelongo’s immigration story resembles those of a lot of Deferred Action for Childhood Arrivals recipients. She remembers living in a small town in Mexico and walking to the alfalfa fields from her grandparents’ house. She doesn’t remember a whole lot else. That’s because a “coyote” drove her across the U.S.-Mexico border when she was only 6 years old, something she knew even then was a big opportunity: She’d be able to reconnect with her parents. Today, Montelongo is a 23-year-old seventh-grade math teacher in Sacramento, California. Through DACA, an Obama-era policy approved in 2012, she was given reprieve from deportation and an opportunity to work legally in the U.S. But now, following President Trump’s decision to rescind DACA, her future is uncertain. Montelongo is one of an estimated 20,000 DACA recipients who are currently teaching in K-12 classrooms. Those teachers risk losing their jobs should Congress fail to muster a fix. 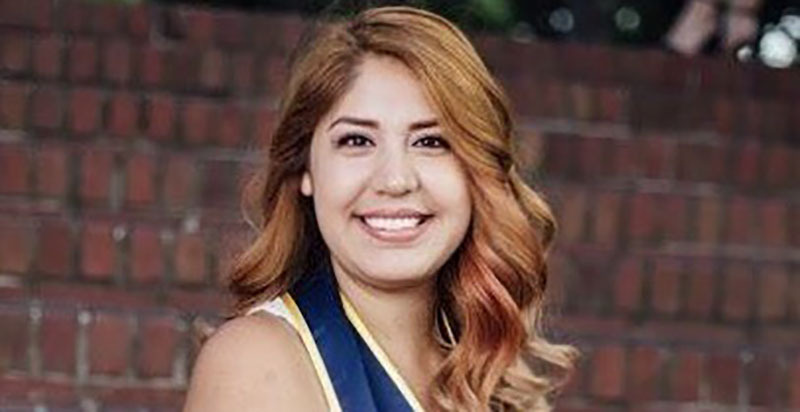 As part of The 74’s ongoing coverage of Trump’s DACA decision and its aftermath, we spoke with Montelongo to hear her firsthand perspective about how she and the students she serves every day are affected by the policy shift. The conversation was lightly edited for length and clarity. When did you first realize you were undocumented? I always knew that I was born in Mexico. I think the reality of what being undocumented in this country meant for me began in middle school. I was offered a scholarship to attend a summer program at UC Irvine and I just needed to fill out an application for the program, and the application requested my Social Security number. I had filled out the application with my counselor, everything was set, all I needed to do was go home, ask my parents for my Social Security number, and get their signature. When I got home that day, I asked my parents for my Social Security number and they told me I didn’t have one, and for a while I was like, “OK, what does that mean?” As I continued my education, that became a little more clear about how I didn’t get access to different opportunities like my peers did. How did your status affect your schooling and your ability to participate in education? I did feel like I had to work a little bit harder than my other peers because I didn’t have access to things like scholarships or I had to do my own research on how it was that I was eligible to attend college. Stuff like scholarships was the biggest one. Oftentimes when schools talk about higher education, or education in general, they present it with the assumption that everyone in the class is documented, but for students like me, I actually didn’t qualify to go through the same path as my peers. You went to the University of California, Berkeley. Before you reached college, did you think you’d be able? I didn’t. Growing up, I heard oftentimes I wasn’t allowed to, that college wasn’t an option for me, or at least not a four-year university. I met people throughout my life who did put me down and told me that I was going to end up staying at home, finding a regular job because I didn’t have access to higher education. With that sense of uncertainty, did you participate in your K-12 schooling as well as you should have? I think so, because when people would tell me stuff like “You’re not going to go to college, if anything you’re going to end up at community college,” my reaction was like, “Well, I’m going to prove you wrong.” I knew that I was going to have to work harder to prove myself and to show that I did meet or exceed the requirements. I always figured if I worked harder, joined as many clubs as I could, and did well in my classes that something was going to work out for me. Can you walk me through your college application process and how you got accepted into Berkeley? I went on a trip my junior year in high school where we actually got to see a panel at UC Berkeley. I met a student there who was undocumented, and I think that was the first time I realized, “OK, there’s undocumented students at Berkeley,” and she referred me to a program that UC Berkeley has for high school seniors. During my senior year of high school, I was part of a program for UC Berkeley that walked us through our application process, worked with us on our personal statements, worked with us on FAFSA, scholarships, all of that stuff. I was very fortunate that I got to participate in this program. It’s an interdisciplinary major called development studies, which focuses on the development of Third World countries or just underdeveloped communities. It looks at those communities through the lens of economics, politics, sociology, psychology, the different aspects of how a community grows and prospers. How did your personal upbringing and experiences influence you to study that discipline, and what did you hope to do with that degree? My major allowed me to explore poverty further and how communities develop. As I studied my major, the focus that I paid the most attention to was education, and I always felt that education was a way of improving our communities. If you don’t have an educated population, you really are going to struggle in the future. So through my major, I decided I wanted my focus to be education because I feel like if we can educate our population, then we have an opportunity to advance. I had a prior interest with math, so I also completed my credential in mathematics, so I’m currently a math teacher. It seems joining Teach for America was a pretty natural fit for you. I feel like it’s an extension of my major. It’s an extension of what I’ve already been interested in. It’s just looking at the systems that are set in place, how it is we can improve the communities that we have. What effects do you believe your status has on your classroom? Do your students know you’re a DACA recipient? What does that knowledge mean to the kids you teach? My students are aware of my status. I did come out to them post–election results, and the way I like to use it in the classroom is, no matter what your situation and how difficult it is for you to succeed, I’m proof that it is possible. I can resonate with a lot of my students who come from similar backgrounds or know someone who also is undocumented. When students first see me, the first thing they want to know is my age, because I am young, and I do tell them my age. They all know I’m 23, and I try to use my age as an example to them that it is possible. I am young and I am a teacher, but I kind of basically tell them, no matter what obstacle you’re going to face in your life and no matter how many people are going to tell you that you can’t do something, you can. What percentage of your students do you estimate are undocumented? What are you hearing from these children in the Trump era? I wouldn’t know an exact percentage of students that are undocumented, but while they’re not undocumented themselves, some of them have undocumented parents or another family member. I would say roughly around 20 percent, and I’m basing this off what I experienced post–election results. The day afterward, my students came into the classroom, and as I observed my classroom a lot of them were in fear, a lot of them were supporting each other through hugs, and the topic they wanted to discuss was, “What is he going to do about immigration?” That was the realization that this is real for a lot of them. We actually had to send students home because they were fearful that their parents wouldn’t be home when they got there. I do know that we have a big population of students who are either undocumented themselves or have a family member, just based on what I saw that day. Do you have any specific stories about connecting with any of your students over immigration status? After I opened up about my own status, and even now as DACA has been ended, I once again spoke out to my students about my status, and through that, students will come up to me after class and tell me, “Ms. Montelongo, I’m in the same situation,” so that opens up a conversation between us of, like, “What now? What’s going to happen?” It allows me to be able to answer some of the questions that they might have. I’m going to go back to the election results. That day, I hosted an open discussion during my lunchtime and I welcomed all of my students to come in and just have a conversation about what was going on, asked them if there were any questions they were still wondering. I expected a couple of students who were actually serious and wanted to know more, but I ended up having a packed room where I didn’t have enough seats for my students. So that’s one of my most memorable days, that these students took their own lunchtime to come in and have this discussion because it is important to them and the people that they’re surrounded by. How do you think the elimination of DACA could affect you? DACA is what allows me to work, to legally be in the classroom. Now that DACA has been removed, there is some uncertainty about what my future is past the two years of my work permit expiring. So I’m kind of living on a deadline right now to where I don’t know what my life is going to look like past these next few years. I don’t know if I’m going to be able to stay in the classroom, I don’t know if I’ll even be able to work using my degree. How often do you run into people in your community who favor strict immigration enforcement, and in general what is your message to them? I am very fortunate that I live in California, and the people that I am surrounded by definitely support me. It’s not often that I actually run into someone who is opposed to my presence here. However, I’m very active online, and I run into that almost daily. Some of those comments are very dehumanizing and very oppressive. If I had the chance to just talk to someone, I think my first words would be, “Do I look like an alien?” I know that sounds weird, but “alien” is the term that’s often used to describe someone who is undocumented, and just process that. You’re actually referring to people as illegal aliens. I think that wording is very problematic because they’re taking away humanity from people. We are people. I am a person, and I consider myself American. I don’t have very many memories from my actual country, so for someone to tell me to go back home, like, this is my home. I’m already here and I’m not an alien. I’m human and this is my home. Do students benefit from having teachers who are DACA recipients? I think it gives them a role model, someone who has been able to overcome such a challenge in this country, someone to show them that things in their lives, their dreams, are possible. At least in the community I work with, for a lot of these students their teachers are one of the only positive role models that they have in their life, and so for me to come with the story that I have, I feel like that definitely resonates with a lot of my students. I might not have a lot of the same challenges that some of them do, but I am able to be a positive role model in their life, someone that can be an example of the possibilities that can come through education. I hear a lot of people talking about DACA recipients’ parents, who are often criticized for bringing their children illegally to the United States. Is that a fair representation of your parents and the parents of other DACA recipients? Not at all. I think oftentimes people say, “Oh, immigrants should just get in the back of the line, apply for a visa and whatnot.” I don’t think people realize how difficult it actually is to do that and how long the process of applying is. I am very appreciative toward my parents for what they did for me. Someone doesn’t just leave their entire country, their entire life, because they had it easy. They don’t leave what they had behind because they aren’t certain that that’s the best choice for their family. Oftentimes when we talk about the immigrant community, we disregard the efforts that our parents put in to try to give us a better life. Schools across the country have declared themselves “sanctuary schools,” basically establishing policies to ensure that undocumented students know they’re safe in their classrooms. What do you think about these efforts, and are they adequate? It’s amazing to see how much support has risen for the immigration community. Schools are the safest place for a student to be, and so for districts to come out with statements saying they are sanctuary schools or they are safe havens, I think that gives students who leave their house every day with comfort. Every day we ask students to come to our school sites, and for the immigration community, just leaving their house puts them in immediate danger of being stopped by the wrong person and being detained. To know that schools and campuses are a safe place to be, I think it gives students and families a sense of relief that they can still continue their education despite what’s going on in the world. If DACA recipient teachers like yourself are removed from the classroom, how do you anticipate that would affect students and schools? Speaking just in general terms for California, we currently have a huge teacher shortage, and to remove teachers who want to be in the classroom who want to connect with the communities that need the supports, I think it’s a disservice to the students because you’re removing teachers who want to be there for them every day. Because you’re able to relate to your students who themselves are undocumented, what are some of the challenges you’re able to observe in these students’ abilities to receive an education? Now that DACA has been ended, some challenges these students are going to face are similar to the ones I faced because I was in school pre-DACA. They definitely will have a lot of uncertainty toward the opportunities that they have as they get older. Is Trump’s decision to end DACA going to quote-unquote “push you into the shadows”? I like to think not. I think President Trump ending DACA puts the pressure on Congress now, and so I’d definitely like to think of the good in people and hope that something good does come out of this, and that something is passed so I don’t have to go back into the shadows. Even if nothing does happen, I don’t believe I’m willing to go back into the shadows so easily. I’m going to try to be as vocal about my situation as possible because I don’t think it’s fair that I’ve worked this hard just to be pushed back into the shadows.